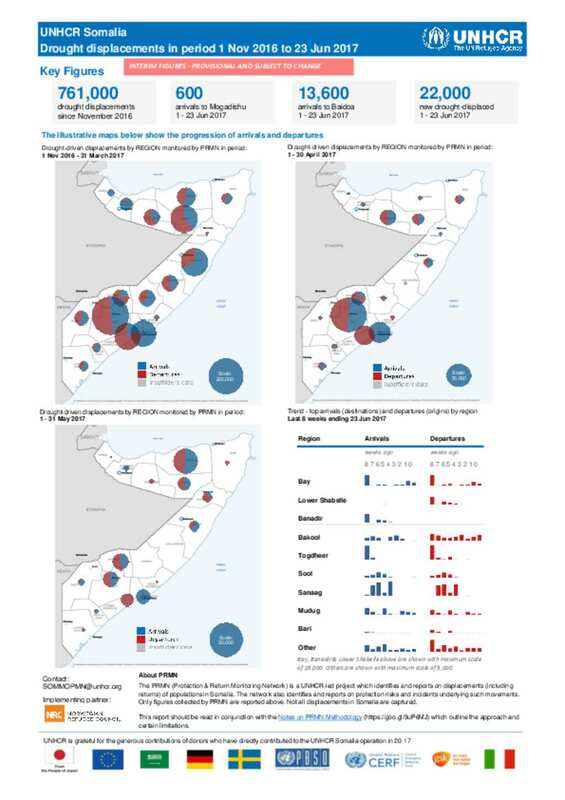 UNHCR PRMN Interim statistics package for Somalia drought related displacements to 23 June 2017 Key Highlights •	22,000 displacements drive by drought were reported during the period 1 to 23 June 2017. In the last two months, a significant decline in new movements has been observed compared to the month of March and April when 131,000 and 278,000 people respectively were recorded. •	The number of people drought-displaced monitored by the PRMN network from 1 November 2016 to 23 June 2017 totals 761,000. •	Baidoa witnessed a spike in arrivals during the period 1-23 June with 13,600 arrivals compared to just 4,700 the whole of May. ew drought-driven arrivals to Mogadishu totalled just 600 in the period under review. •	Approximately 16,300 individuals (of which 9,800 in June so far) are reported to have returned to their villages of origin in Bay region – predominantly to villages within Baidoa district but also to Dinsoor and Qansahdhere districts.